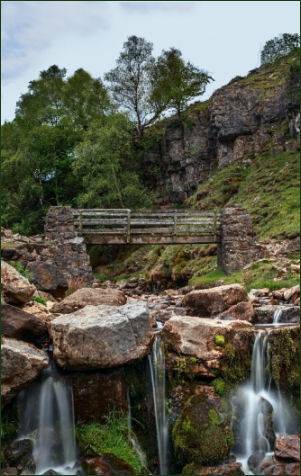 Swinner Gill near the Yorkshire Dales village of Keld is a wild, rugged and remote area. Water from the gill flows down from its source on Rogan's Seat south towards the River Swale cutting through the rock, resulting in a number of waterfalls on the gill. There are two main waterfalls and a number of small stepped drops. The larger waterfall is situated around 250 metres from the head of the gill and the other is near the crumbling remains of Swinner Gill Lead mines. A path climbs up alongside the stream to join a shooters' track at its head. A track leads from the Farmer's Arms at Muker up through Swaledale past the ruins of Crackpot Hall to reach the foot of the ravine of Swinner Gill and the old lead mine smelt mill. There is a pay and display car park just on the edge of the Muker and free parking in the lay-bys next to Straw Beck at the other end of the village.